According to one press report, the jobs massacre will take the form of “rolling layoffs” that will continue until the end of the month. Three assembly plants—Lordstown, Ohio; Detroit-Hamtramck; and Oshawa, Ontario—along with Warren Transmission in Michigan and a propulsion plant in Maryland—are slated to close by the end of the year, devastating entire towns and cities. 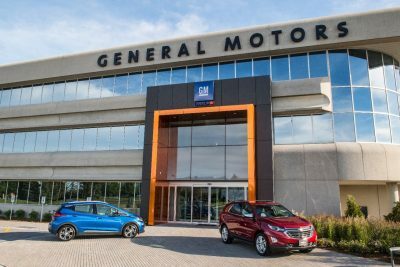 One report said that GM management was determined to begin the layoffs before the company releases its fourth quarter 2018 and full year 2018 earnings reports on Wednesday, which are expected to show a drop in profits. This underscores the fact that Wall Street is cracking the whip on GM and the rest of the auto giants to press ahead with cost-cutting and stepped up attacks on the workers in order to drive up stock prices and the speculative profits of the banks, hedge funds and big investors. GM has said the job cuts and plant closings will free up $6 billion in cash, but the automaker has spent $10.6 billion since 2015 buying back its own shares in order to fatten the portfolios of the financial oligarchs. The cuts have generated enormous anger and opposition among autoworkers in the US and Canada, who have never recovered from job cuts and concessions imposed with the collaboration of the auto unions as part of the Obama administration’s 2009 forced bankruptcy and restructuring of GM. The cuts will further impoverish regions in both the US and Canada that have been ravaged by decades of deindustrialization. Last month, workers at the Oshawa assembly plant staged a five-hour sit down protest after GM CEO Mary Barra announced that she would not reconsider the decision to close the factory. Workers took the action independently of Unifor, terrifying the union officials and sending them scrambling to quash the rebellion. The World Socialist Web Site Autoworker Newsletter and the Steering Committee of the Coalition of Rank-and-File Committees have called a demonstration for February 9 outside GM headquarters in Detroit in opposition to the plant closings. It has called on workers to mobilize independently of the UAW and Unifor to defend their jobs and living standards and link up with the struggle of 70,000 Mexican autoworkers in Matamoros, across the border from Brownsville, Texas, who have been carrying out a wildcat strike for nearly three weeks. The demonstration is not an appeal to GM and the corporate bosses, but rather a call for workers to mobilize their strength and fighting determination through the formation of rank-and-file committees independent of the pro-corporate unions and the corporate-controlled politicians and parties. 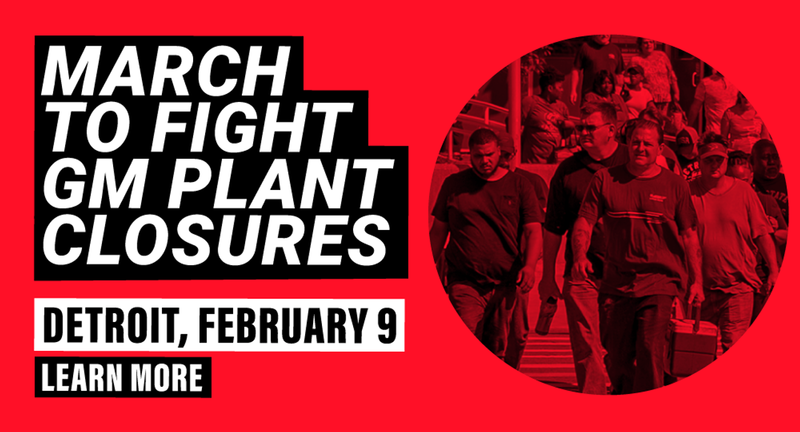 (See: “February 9 demonstration against auto plant closures in Detroit: The program and strategy to defend jobs”). The call has garnered widespread interest and support. A central theme of this action is the unity of US, Mexican and Canadian workers against job cuts and concessions and against all attempts to divide workers along national lines. This means an implacable struggle against the economic nationalism promoted by the unions. The response of the United Auto Workers and Unifor in Canada to the plant closures is to spew nationalist poison. This week, the United Auto Workers announced that is joining a boycott of GM vehicles assembled in Mexico previously initiated by Unifor. These same organizations oppose any industrial action by GM workers to fight the layoffs. They plan to use the threat of plant closings to blackmail workers into accepting new concessions that will be demanded by the auto companies in contract negotiations later this year. The call for a boycott targeting the jobs of Mexican workers is an attempt to divert workers from a struggle against the real enemy—the transnational auto companies and the profit system as a whole—and instead channel their anger against their fellow workers south of the Rio Grande. In this way, the unions line up behind the Trump administration’s fascistic attacks on immigrant workers from Mexico and Central America. The announcement of the GM closures takes place against a background of growing worker militancy around the word, including strikes by autoworkers in Hungary, yellow vest protests in France, a general strike in India and a walkout by 30,000 teachers in Los Angeles. Of particular concern to the UAW and Unifor is the strike by the maquiladora workers in Matamoros against sweatshop conditions at auto parts manufacturers and other industries. To this date, the UAW has not said a word about the heroic actions of the Matamoros workers, who launched their strikes independently of and in opposition to the official unions. “It is not the fault of Mexican workers. It is corporate greed. They just want more profits. A General Motors worker at the Delta Township assembly plant near Lansing, Michigan said he planned to attend the Feb 9 demonstration. “It is not the Mexican workers’ fault. They are trying to provide for their families. “GM is closing five plants, but they are making record profits. They are trying to force the older workforce to retire by placing them in other plants and making them drive long distances. It leaves them little time for their families. They can’t just relocate and buy new homes. It forces them to retire. Meanwhile, Unifor says it plans to run ads promoting its anti-Mexican boycott during this Sunday’s Super Bowl football game. These ads are extremely costly, reportedly $5.25 million for a 30 second spot, or roughly the equivalent of the monthly dues contribution of 100,000 workers. The nationalist “Buy American” and “Made in Canada” campaigns of the UAW and Unifor are both reactionary and absurd. They ignore the global character of production, which makes it impossible to determine the “nationality” of any given vehicle. After ignoring the strikes in Matamoros for weeks, Unifor President Jerry Dias announced his “support” for striking Mexican autoworkers in a perfunctory statement this week. This followed determined attempts by the establishment media, pseudo-left groups, Unifor and the UAW to black out all news of the strike by Mexican workers. The launching of mass layoffs by GM gives added urgency to preparations for the February 9 demonstration in Detroit. The WSWS and the Socialist Equality Party call for the widest possible mobilization of autoworkers as well as other sections of the working class, teachers, auto parts workers, Amazon and United Parcel Service workers as well as students and youth against the plant closures and layoffs.